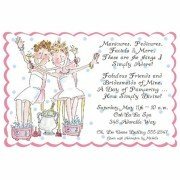 Size: 5.75” x 8.75” Includes: Invitations, White Envelopes and Ribbons Card S.. 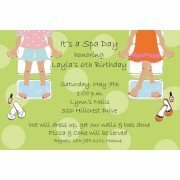 Size: 5.75” x 8.75” Includes: Invitations, White Envelopes Card Stock: Printed on 80 lb. .. 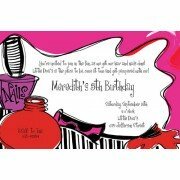 This two piece invitation in the shape of a flip flop features a top card that swings to the side.. 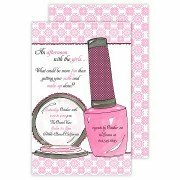 This invitation in the shape of a bottle of nail polish is embellished with a leopard ribbon. Whi.. 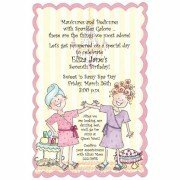 This charming 5.75" x 8.75" invitation is perfect for a shower or spa party. White envelopes incl.. 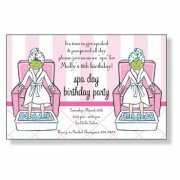 This 5.75" x 8.75" invitation is perfect for birthday, or spa themed party. White envelopes .. 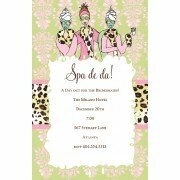 This 5.5" x 8.5" invitation is perfect for a shower or spa theme party. White envelopes included ..